'Moderate' Fatah praises 'heroic' murderer of three-month-old, celebrating his 'wedding' to 72 virgins in paradise. Palestinian Authority (PA) Chairman Mahmoud Abbas's senior aid Sultan Abu Al-Einen already hailed the Hamas murderer of a baby in Jerusalem on Wednesday as a "hero" - now Abbas's Fatah party is keeping the terror glorification going. Abdelrahman Shaludi of the Shiloach (Silwan) neighborhood rammed his car into a crowd of Israelis at the Ammunition Hill light rail station, wounding nine including three-month-old Chaya Zisel Braun hy''d who was fatally injured. Shaludi was shot by police as he tried to escape, and later died of his wounds. Abbas's Fatah faction posted an obituary for the terrorist on its official Facebook page Thursday, as revealed Palestinian Media Watch (PMW), in which it called his death "his wedding" in a reference to the Islamic belief that "martyrs" are wedded to 72 virgins in paradise. "The Palestinian National Liberation Movement (Fatah) - Silwan branch accompanies to his wedding the heroic martyr Abdelrahman Shaludi, who carried out the Jerusalem operation, in which settlers in the occupied city of Jerusalem were run over," wrote Fatah. The page of Abbas's "moderate" Fatah then addressed the dead terrorist with the words "rest in peace! We are loyal to you." In the post an image of Shaludi was included, with text on it reading (Koran, Sura 3:169) "and never think of those who have been killed in the cause of Allah as dead. Rather, they are alive with their Lord, receiving provision. Fatah Central Committee member Mahmoud Al-Aloul also shared the Fatah post on his personal Facebook page, reports PMW. As noted, the Fatah glorification comes after similar statements by Al-Einen, who in fact has a long history of praising terrorism. 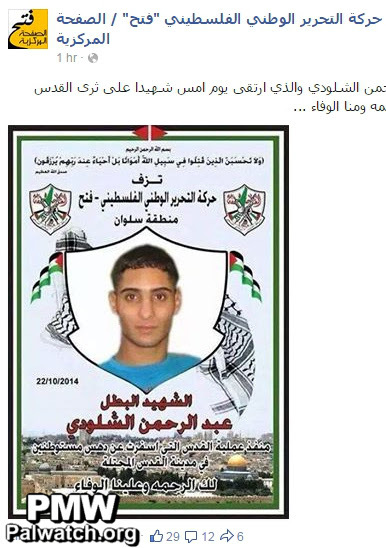 The PA senior official praised Salam Al-Zaghal, the terrorist who murdered Evyatar Borovsky hy''d last May, calling him a "heroic fighter" and saying "blessings to the breast that nursed Salam Al-Zaghal." 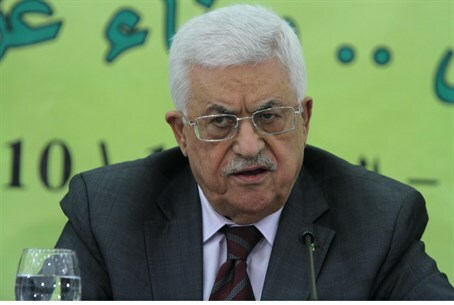 PMW exposed the comments, leading five senior American legislators including Ed Royce, Eliot Engel, Nita Lowey, Ted Deutch and Brad Sherman to demand that Abbas remove Al-Einen - Abbas ignored the request.